I was pleasantly surprised by the read-out on the scales this morning. I must confess to being very naughty over the last two days. It started on Monday evening when I suggested we had a well earned treat for our Evening meal. We first thought of the Indian buffet, but we’d done that last week so decided to go all out and have KFC! Paul drove round and collected our usual, a Variety Bucket containing 4 pieces on the bone, 4 breast strips, 4 bags of fries and a small popcorn chicken. In the time it took him to return from the drive-thru, I had opened and heated a tin of baked beans to go on the side. Considering this, you’ll see why I’m pleased not to have gained any weight, never mind hoping to have lost any! 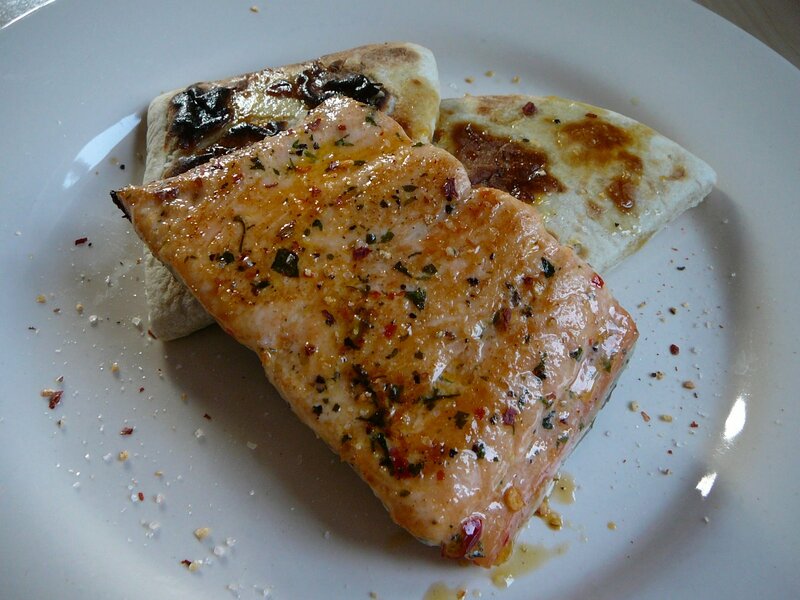 You can see here that I’ve made amends tonight, here’s my evening meal, Lime and Coriander Salmon on a bed of Potato cakes with a drizzle of tomato olive oil and a grinding od chilli and garlic. Olive you to to work it out. I promise, I have some ideas for real posts soon, until then humour me, ok? 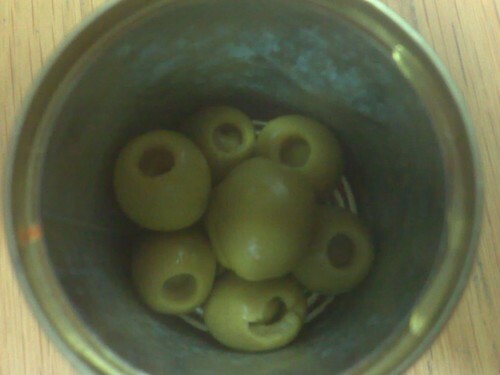 I was recently irked by these otherwise wonderful olives. Lets take a closer look, can you spot the irksome item? 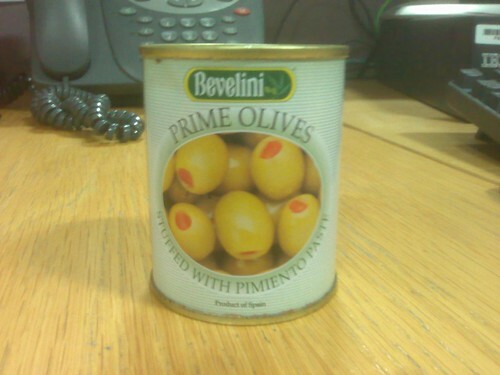 Yes indeed, thats right, the complete absence of the promised pimento paste is quite a dissapointment! 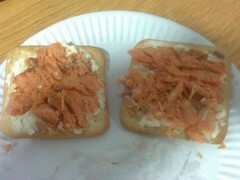 snacking on cream crackers topped with laughing cow cheese and red salmon. I truly do live like a king! I’m in something of a connundrum! According to the scales this morning I was 11 stone 3, then a few hours later the Wii-fit said 11 Stone 2 pounds. I checked myself on the scale again a few minutes ago and it said 11 Stone 4 Pounds, so I’m going with that. 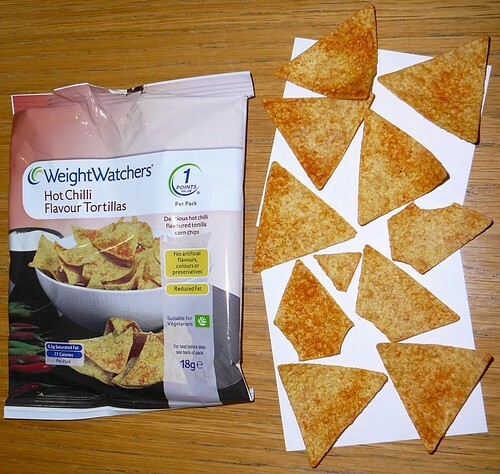 When I bought the multipack of Weightwatchers Hot Chilli Tortilla chips, I marvelled at the fact that each bag was only 1 “point” or 77 calories. “How on earth could this be,” I thought. Look at them, dont they look wonderful? Yes thats right, you’ve spotted it, thats how they keep the points and calories down. They only put 10 in each bag! I ventured into the loft the other day, thinking to quickly stow the new LCD TV box in case of needing to return it, should it fail. I’m practical like that, something learned from my Mother the notorious hoarder. Unfortunately this turned into an hours job when I realised that I couldnt find space because of all the other boxes already up there. 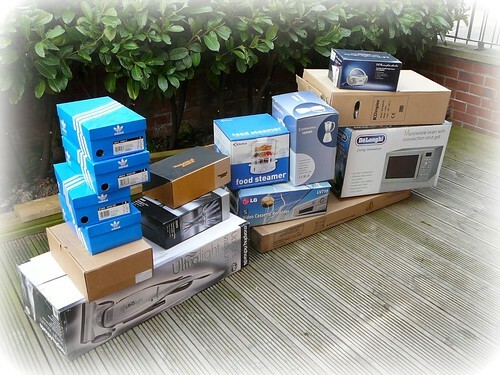 Some thing had to be done and since some of these boxes are for things that are well passed their guarantee period, they had to go. You might think that after this impressive clearout, there would be room up there to dance a dainty tango! Sadly no, there are probably just as many, if not more boxes still up there 😦 So, can you guess what I’ll be doing next weekend? PS, Paul will kill me when he’s seen this is online! You are currently browsing the Andy2boyz's Weblog blog archives for April, 2009.